I was so excited to see fresh rice noodles at Trader Joe's today! Silky, fresh rice noodles are a different animal from regular dried noodles. Like other fresh pastas and noodles, they cook very quickly, and lend themselves perfectly to the bright, bold flavors and textures in this Vietnamese Bun-inspired salad, which happens to be the perfect potluck food--portable and delicious at room temperature. If you don't live near a Trader Joe's, look for fresh rice noodles at your local Asian specialty grocery store. Also, feel free to switch up the protein (grilled chicken or shrimp would be nice) and/or add other toppings, like roasted, crushed peanuts, cilantro, green chiles or bean sprouts. Add the tofu and cook, undisturbed, for 3-4 minutes on each side, allowing a golden-brown crust to form. Salt lightly and remove from pan. Place the onions in the hot pan (you shouldn't need to add more oil), and let them brown, 6-7 minutes, stirring once or twice throughout. Remove from pan. 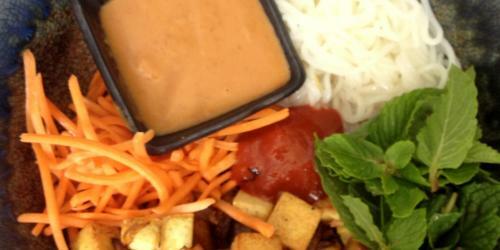 In a large bowl, toss together the tofu, onions, noodles, carrots, mint and peanut sauce. Serve immediately, passing hot sauce or Sriracha at the table.